The First Time Attendee's Guide To The Monterey Jazz Festival : A Blog Supreme A few clues to getting around the Monterey County Fairgrounds during its world-class jazz event. 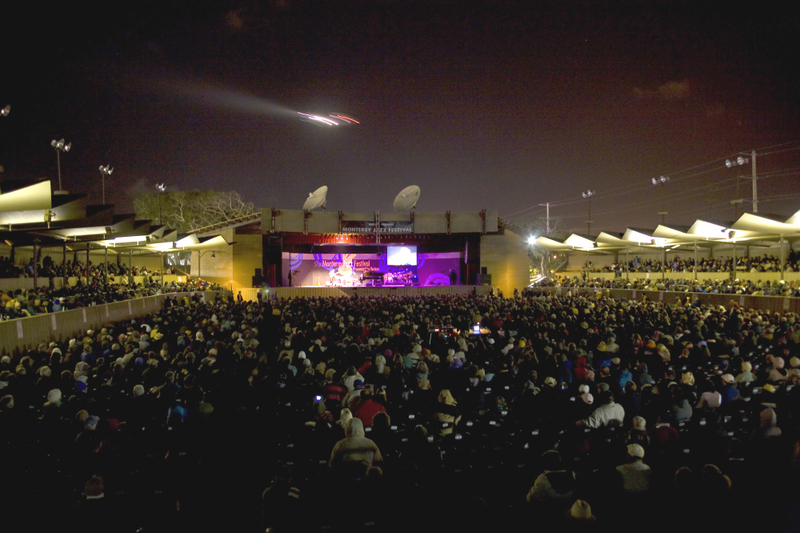 An airplane flies over the Arena Stage of the Monterey Jazz Festival. My first Monterey Jazz Festival was in 2005. I went on a whim. I've been back every year since. The setting, the lineup, the music, the food and the warm, casual, welcoming vibe proved irresistible. This year will be NPR Music's first visit, so Patrick asked me to give him a few clues to getting around the oldest continuously-running jazz festival in the world. Plan your itinerary, but be flexible. (Download the very helpful iPhone/Android app, if you have a smartphone.) This year's lineup, as always, is impressive and eclectic — from Herbie Hancock to Huey Lewis, Sonny Rollins to India.Arie, and a whole crew of New Orleans musicians representing the HBO series Treme. Geri Allen is this year's commission artist — the Festival commissions a new work every year. You'll almost always wish you could be in two or three places at once. If you have Arena tickets, you can get into all events on all eight stages; try to make at least one event on each stage to get a feel for the place. If you have Grounds tickets, you can get into everything except the Arena. Many Arena artists also perform on the grounds; others drop in unannounced to sit in with friends. Go early and stand in line if there's someone you really, really want to see. Each year, the Coffee House hosts some of the most exquisite piano and/or small-group music the Festival offers. For instance, pianist Bill Carrothers makes his MJF debut there this year. It's also the smallest venue. Go star-gazing. At some point, you'll see Clint Eastwood stride through the grounds. He's been a Festival friend, supporter, and board member for years. You'll also see artists walking around, hanging out with friends, and checking out each other's music. We've made room on a bench at the Garden Stage for Fred Hersch and seen Kurt Elling sprawled on the grass in the food area. This year, artist-in-residence Joshua Redman will probably be all over the place, as will showcase artist Robert Glasper. Don't try to predict the weather. It can change several times during the day, so just be ready: for chilly fog, blazing sun (especially in the Arena), occasional mist and cool evenings. Dress in layers. Bring a hat, a jacket or blanket, sunscreen, shades. Fur coats are seen in the Arena at night. Eat the food. It's tasty. Thai, Indian, Jamaican, bratwurst, peach cobbler. If you get the barbecued ribs (highly recommended), use your fingers. Being a lady, I tried the plastic-knife-and-fork approach once at a table full of friends and will never hear the end of it. Find Paul Aschenbrenner. He's been a gatekeeper at the Arena for many years, and he wears funny hats and costumes. Sometimes he's a prisoner, sometimes a moose or a lobster. His smile is real and his enthusiasm for the festival infectious. Say hi. Hang out at the Hyatt Regency. Many of the Festival artists stay at this hotel near the fairgrounds. They have breakfast and lunch in the restaurant, meet friends in the lobby bar and come to the after-parties each night. Last year, I happened to be standing outside the lobby early Sunday afternoon when a white van pulled up. Out stepped the majestic Ahmad Jamal. Stay until the very end. If you're in the Arena for Sunday's final show, make your way slowly toward the gate near Dizzy's Den and the Night Club. Something will be going on. Stop in. We've seen Dee Dee Bridgewater sing way past her end time, and Christian McBride join Roy Haynes on stage. Those final notes on the nearly-empty grounds can be the sweetest of all. Try to see a little of the area. Even if you're here for the jazz, you're also in California. The Monterey Bay Aquarium is awesome. So is the golf at Pebble Beach. You can walk the Monterey Bay Coastal Recreation Trail from Monterey to Pacific Grove and back again: highly recommended. Carmel is nearby, with its zillions of galleries and white sand beach. Big Sur is down the coast; the drive is breathtaking and hair-raising. Enjoy and keep your eyes on the road. Pamela Espeland is a jazz writer based in Minneapolis-St. Paul. She blogs at Bebopified and contributes to KBEM-FM radio. She'll be assisting with our coverage at the 2011 Monterey Jazz Festival.